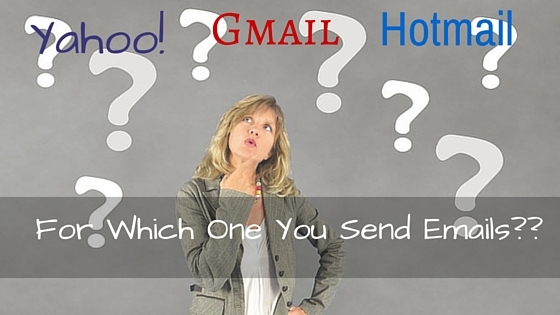 For Which One You Send Emails – Yahoo, Gmail Or Hotmail?? An email is useful only and only if it can be seen in Inbox rather than Spam Folder, obviously because it increases the chances of email being read. Deliverability is the main part in the overall success of an email campaign. I understand, It’s frustrating as Internet service providers keeps on changing rules and their algorithms that ultimately affect your email landing in the inbox. In previous days of email marketing, we only had to think about a our dear desktop email clients. But now, we need to even work upon marketing emails to make them look correct in a series of desktop clients, classifying from Yahoo to Gmail to Outlook and what not!! Apart from this, you can’t avoid your mobile users as 53% of people read email on their mobile devices. Never let all this stupidity comes in between email clients and their devices get you down. Before going through how to create an email which can be settled perfectly on different mail addresses let’s have a look into the most popular email clients receiving your emails. It’s a very big issue that how we can optimize our marketing email in such a way so that that one powerful email can be read perfectly in every platform. Here are 7 Methods by which you can create a Perfect Email that can suit every platform which your client uses. 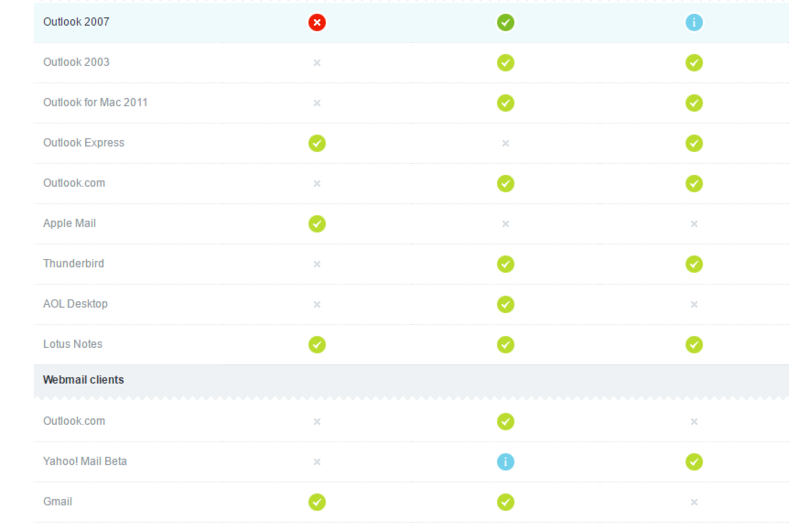 for you to check what is supported by different email clients. This is how you can let your clients see your email as you wanted it to be seen. For some email clients it’s really hard to please when it arrives to marking emails as spam. The other way to help your emails land it into people’s inboxes only is by optimizing a plain-text version of your emails. You can take help from a no. email marketing tools that will let you easily optimize a plain-text versions within their email editor. Keep it in your mind that whom you’re sending your mails all of them are not using the same platform to open your message, different people will load your emails in different platforms, so it’s important that your links must follow an absolute path. If your recipients are of outside your company network, then relative links can break and make your content unavailable to view. In the same track getting sure that you provided an absolute path to your links, even make sure that all the URLs of your images are relative to their absolute path too. Because your recipients would not be able to see the images that are attached with their relative paths. Images are the attraction of your emails. Don’t forget that many of your clients by default have blocked images.Which means untill they don’t allow or click to change their default setting they won’t be able to see your images. What if you provided you main content in your images, simple your email will be wasted. Adding alt text to your images will help your client to read out the message even if the image is blocked. Here’s a list from the folks at Campaign Monitor that which email clients block images by default. Outlook never recognizes background images, so it would be best not to use background images altogether. Instead, you can use a background color and images in some other ways in your email. Hotmail even doesn’t recognize images, so it’s best not to use them. PNG formats are not supported by Lotus Notes, so you can go for JPG or GIF format instead. The starting lines of your email text could be the judging factor for whether you email is going to opened list or spam list. Litmus suggests check your preview text as a secondary subject line. Email clients using the iPhone Mail app, Gmail, Outlook or Yahoo will display the first few lines of the body of your email with the subject line. So, be sure that that your starting lines should be strong enough to complement your subject line so that it can let your recipient open you mail. Even if you’ve checked your t’s and dotted your i’s, it’s still important to check your complete email once again whether your email is appearing as good as you thought. Before shooting your emails always check the preview that how your email looks like in different email devices that are popular specially those are popular. Sending a test version of your email before shooting your emails is a very good way to check the look of your email. Optimizing your emails in accordance with your different email client is getting necessary day by day How you used to optimize your emails for different email surfaces? You can share your tips in the comment section.